When night falls, spirits rise. A ghostly figure, a redheaded woman, drifts the city tracks, eternally lost. The anguish of the departed, a man who impaled himself on an orchestra pit chair, chills a historic theater. Forlorn howls and scraping claws-wolves, buried with their owner, alive-seep from a nearby mausoleum. 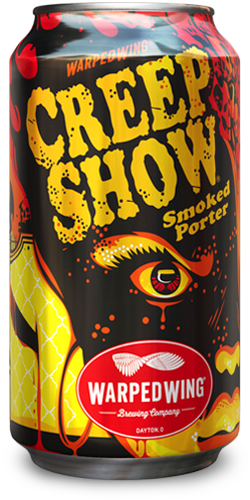 CreepShow Smoked Porter. Smokey. Malty. Dark as Dayton without a moon.